There is a little misconception about malware that it only exists on computers. However, what most of us are not aware of is that there are different & common types of Android mobile malware available on devices as well. These malware perform the same operations as on a normal computer system. Today we rely on our smartphones for different tasks like banking, sharing personal information, saving credentials and other daily tasks. Information that we enter on our smartphones can be intercepted by hackers and can be used for their own benefits. This popular Android mobile malware will steal all banking related information that is on user’s device. It will also intercept banking transactions and steal all the important information. We use mobile banking so that we can access accounts while on the go. Mobile banking is very convenient as we do not have to carry laptop everywhere and can easily access our accounts and perform any transaction wherever we want. However, this can be a major security issue if our devices are affected by malwares. Ransomware also exists for mobile devices. Our smartphones are the devices which stay with us every time and a lot of important information is stored on it. Like on the computer, Ransomware behaves in the same way on an Android device. All your personal files will be locked by the Ransomware and in-order to unlock the files you will have to pay money. Spyware on your Android will monitor, record and send all your information to the attackers. It will steal all the information you enter on your Android device. Spyware will come attached with some application and it will go unnoticed until some security software is installed on your device. Most of the applications that you directly download from the Internet contains spyware. 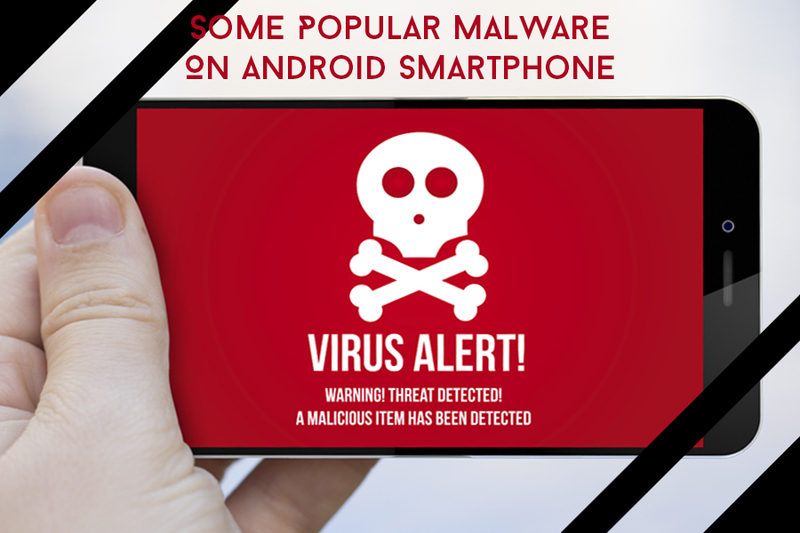 This is the most common and all time popular android malware that a smartphone phone gets infected with. Having adware on the device can be a very frustrating thing, as you will receive continuous popups and ads on your screen. Also, if any of the ads is clicked then another malicious program will be downloaded or some unwanted application will be installed on your device. Another type of malware that users encounter is the malware which will make fake calls and send SMS to the contacts. The messages that are being sent contains malicious links, and which the receiver taps on the links they will also get infected by the malware. Malware and other malicious files are present on every device. This Android device popular malware can harm our devices in the same way they do to our computers. Our mobile devices are more prone to attacks due to lack of security software and lack of knowledge. We should be ready for any attacks that take place on our Android mobiles.